Before I say anything else, I just want to say we are SO GLAD you are here at Christmas Mass with us. Truly. We are so happy to see you. I know, I know. It might not always seem like it. But really! We are! We're thrilled you're here. We really hope you feel welcome and we are sorry for the ways that we might fail in making it so. We're here and come to Mass so much because we know we're kinda messed up ourselves. So we may not always greet you the way our hearts truly want to because we're absorbed in our own little worlds or have had a rough, stressful day. And sometimes some of us are just plain cranky because we're tired or sick or have our own little issues going on. Or because we're sometimes a little petty and lost our favorite pew. We're sorry about that, truly. We do want you here. We're actually thrilled you're here with us to celebrate. And I think I can speak for most of us when I say that we're going to try to help you see that more this year. Thank you for taking the time to celebrate with the Church this Christmas. We've been missing you. It's kind of like in a big family when someone is not there for Thanksgiving dinner. It's still good to be together and the turkey and stuffing are still amazing but there is that hole where the absent person is supposed to sit. When you're here, our joy is fuller and our family feels more complete. So thank you for being with us today. Sometimes, I know, the Mass feels a little weird if you're not used to it. There's a lot of sitting and standing and the reciting and ritual and all. It feels a little ancient. That's mostly because it is. It's the ancient prayer of the Church that has been passed down for two thousand years. So there's stuff in there that doesn't always feel like it resonates with us modern folk and we use words and language that feels a little funny in our mouths until we're a bit more used to it. There's loads of reasons why the Church uses those prayers and does Mass the way She does, though. If you're interested, there are lots of resources out there to understand what the heck is going on. They might help you get a little bit more out of your time here. Usually there's a book in the pew that will have most of the Mass parts in it and sometimes even a little explanation so that you can follow along with what is going on. The Mass is one of the most sacred moments of the Church and for each of us here. So our behavior there reflects that. That's why we try to keep it so quiet in the church before and after Mass. People are trying to pray and prepare themselves. And just like you wouldn't be taking selfies or checking your cell phone or texting during a funeral or wedding (I know you wouldn't, right?) it's kinda inappropriate to do that during the Mass as well. Same goes for eating or gum chewing or chatting in the middle of the service. When we put aside all those distractions it separates this time from just normal, everyday life. I know, it's hard if you're bringing kids. Trust me, I know that well. We're so glad the kids are here, too, and sometimes they surprise us when we teach them and raise our expectations of what they can really understand and how they can participate. But even when they don't, we promise we won't give you the stink-eye or let out that sigh or get all cranky on you. (We've probably been right where you are at some point or heck, are doing it right along with you now.) We're glad you're here and that you're trying. The one thing we do during Mass that confuses a lot of Catholics and non-Catholics alike is that Eucharist thing. You know, when we all go up and eat what looks like a little wafer and drink what looks and tastes like wine? That part. Sometimes we call it Holy Communion. That part for us Catholics, along with the prayers before it (the kneeling/standing part), is the supreme most sacred important ultra reverent part of the whole Mass. That is The Moment of the Mass. The whole Mass should be reverent, of course, but that part is like during the wedding when a man and woman are speaking their vows. It's the climax of the whole thing. Because of that, we ask that those joining us stay extremely reverent and respectful during that part. The Church also asks that if you are not Catholic or if you are a Catholic who has fallen away from the Faith or haven't been joining us to worship every week (unless you went to Confession before coming in which case, awesome. ), that you not receive Communion. That might sound harsh, I know. But here's the thing: We Catholics really and truly without nuance believe that that stuff that looks like bread and wine is really and truly Jesus. Like REALLY. We believe we are consuming the Body and Blood of Christ hidden under the forms of bread and wine. It sounds crazy but we really do. So if you don't really believe that or if you're not in a state of communion with the Church either through your own choices or your beliefs, then out of respect for the beliefs of the rest of us there, the Church asks that you don't go up to receive. And that's okay. I mean, someday we'd absolutely LOVE for you to come up with us, but in the meantime, we promise that we won't be all judgey if you don't go up. In fact, we'll respect the integrity that you're showing. We're so happy you are here. We are so grateful when you sing and participate in the prayers with us. We're so happy to see you all dressed up in your Christmas best (those kids look adorable, by the way!) and we love that you're including the Person of honor in your Christmas. I have a feeling He loves it, too, way more than even we do. Because it's really all about Him anyway. No matter how distant you feel from the Church or Him, I just know He is thrilled that you are here and He has so much He would love to give you. No matter what crap you've gone through, what mess your life is in, or how much you've screwed up this past year, you are welcome here. In fact, you'll fit right in with the rest of us. We're here not because we're perfect but because we know we're not. 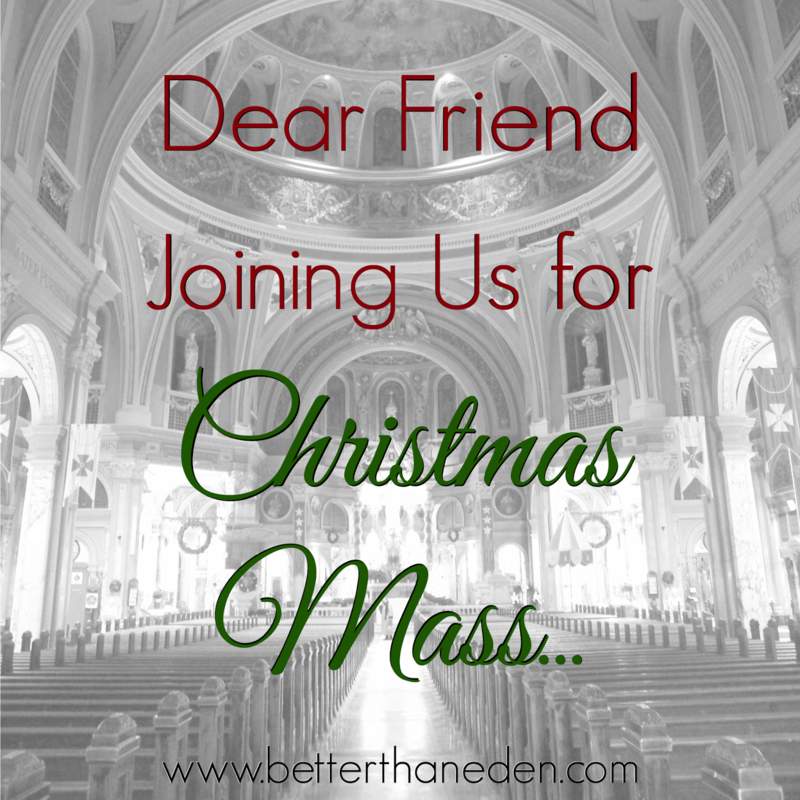 So, dear friend joining us for Christmas Mass, I hope you feel welcome. I hope here you can enter in a bit to the joy and mystery and profound grace that is Christmas. I hope you have a beautiful Christmas season. And we would absolutely love to get to see you again on Sunday. Mary, this is beautiful and well-written. Thank you for this! God bless you! Merry Christmas! This was awesome! God bless! Mary, can you arrange to have this published in every church bulletin across the country (or even our hometown) this weekend? What an inspiration! Welcome home, friends.